Google+ Raising a Trilingual Child: 7 facts that can determine the language spoken between multilingual siblings. The moment you think you figured it all out and your multilingual family found the right balance between the languages for your one and only child, you realize the baby #2 is on the way. And everything you planned so perfectly may go the way you were not expecting! Every parent with 2+ kids would tell you that dealing with two kids is much more complex, it's not really 1+1... So, the main question you never really thought of before: What language would the siblings speak to each other? If your first child is old enough, your "job" is relatively easy. Just talk to him and try to convince that the minority language should be spoken among the kids. However, if your second child comes to this world in a rush ( as in my case, the children have less then 2 years difference between each other), you can not really request the older child speak a certain language. Well... you could ask him, you could beg him, but your older child is still working on his own language development so all bets are off and noting can be guaranteed. So, what happens then? 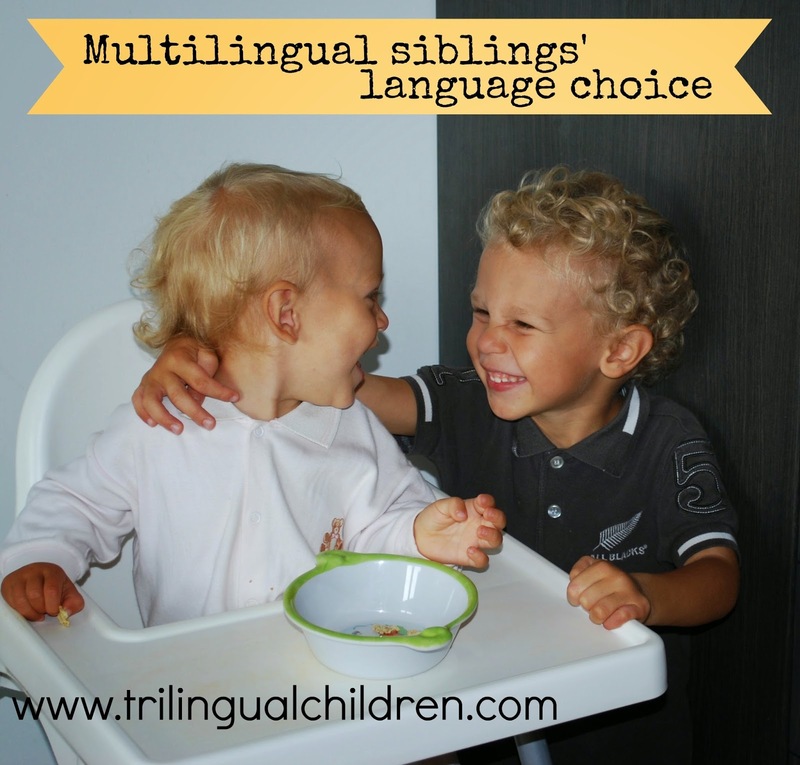 What could determine a choice of the language multilingual siblings speak to each other? a child has a rich vocabulary in the minority language (doing different kind of activities with your child and reading aloud books on different topics helps a lot in expanding the vocabulary). Read my post on How to read to a baby? and Bilingual child: When to start reading? parent - child communication is always in the minority language (even in public). Remember that you can provide a translation or outline of your conversation to others. the minority language speaker is the main caregiver and spends most of the time with the children. the family follows minority language at home strategy (ML@H) . Read more about different Languages strategies. the initial communication between children starts in the minority language environment or with the active participation of the minority language speaking parent/caregiver; thus setting the language for the future communications. To help siblings to settle on speaking the minority language to each other try always listen to what they say while playing together and comment/ participate when it is possible and appropriate. I had to do it for the first 2 years of my younger child's life until she started speaking. I hope this will help parents expecting a second baby. In any case, I do not think it is bad, if kids decide to use a different language to speak to each other as long as they keep speaking the minority language with the parent. If your children speak minority language to each other, please share your thoughts with us. What helped your children to settle on speaking that language? What did you do to support them in making this choice? Should I correct my child speaking? "No English!" Motivation is the key. Great advice! My children use minority language between themselves and I think the main reasons for that are those points you listed: I was the main caregiver, we spent good amount of time reading and playing together (with newborns in hands), I always spoke Russian (our minority) in public. Also, I had little "tricks" in my pocket: I told the older siblings, that baby understands Russian much better, because she spends a lot of time with me; another one: if you don't speak Russian to the baby, how she is going to talk to her babushka (grandma)? It worked. But it might change when all my children are at school and their main language of play and interests will be English. It is well possible that they will switch to English between themselves. But this is a different topic already. Hello, I really liked this post, it is exactly what I was looking for. I am Spanish living in Bulgaria. My daughter who is 5 speaks both languages, but I've been wondering what language will she speak with my son who is 1 and does not speak yet... What you wrote has been really useful, thanks! Thank you for your comment! I am glad that you found this article helpful. Just not that long ago I wondered what would happened to my children and how I can help them to speak the minority language to each other. You could talk to your daughter and ask her to speak Spanish to her brother. She is old enough to understand the importance of preserving the minority language. It would be also great if the spouse can show an example and use some words in Spanish at front of the daughter. My kids just love when their Italian speaking father says some words/sentences in Russian. Good luck to you! and do stop by to share what language your children have settled on. So interesting! Our youngest is just starting to talk, so I am curious what language he will choose to speak! I wish we had done ML@H when my older son was younger. We did OPOL, and now he mostly speaks English. As a result (and living in an English-speaking environment), I suspect my younger son will follow his brother and speak mostly English, though we are trying to speak to him only in Spanish. We will try to reverse this trend with some of the tips you give above, including immersion trips to visit family in Costa Rica! Thank you for leaving a comment! It is so exiting to see when your own children start to converse! I had a blast :) How old is your older son? You write that you wish you used ML@H strategy with your son when he was younger. Did you actually switch to it completely? If you didn't , I think, you should and it is never late to change your language arrangements and start using one language at home. The immersion plan you have in mind is fantastic ! You are so lucky :) My best wishes to you and hope to hear from you soon with the updates! That's an interesting post. I did write some posts about this too and have to say that it probably also depends on how old the children are. If they already go to school (which language they speak there & among their peers...). When children get older, they tend to focus more on what their friends talk. Of course, there is the family language, but when you're already a multilingual family and the children know exactly that you're prefectly fluent in all the other languages, well, then you'll have a very multilingual family situation. I did this when I grew up (with Italian, German and French) and accept that my children switch as well. We have moments where we speak "only" our family language (German): at meals, bedtime, when we drive somewhere (and that's often) and when we have one-on-one time. Thanks, Ute! It is possible that the age can change things some what; however, I believe the older age children are capable to understand the importance of speaking the minority language to the sibling or at list they can be persuaded to do so in one way or another. My focus was on children with a small age difference. I do agree though, that as children grow the language between them can be affected and most likely change to the community language. The environment and the peer pressure is growing exponentially the moment children enter the school. What you say about your family language dynamics is very interesting. I find it amazing that you, as a family, are able to use so many languages within one day. Very interesting post. I am curious if anyone has experience with exposure to 4 languages? I have a 4 year old, 2.5 yo and a 1 year old at home. I always speak ML@H (Farsi) and outside and they have exposure to grandparents. My oldest can express himself the best in Farsi but interestingly has started speaking English with his siblings. He also speaks a lot of English to his father who always speaks to him in German inside and outside the home. We also have a Spanish speaking nanny but she is mainly taking care of the baby and not the older 2. They understand much of what she says but my oldest answers in English and my middle one a mix of English and Spanish. I think this is the effect of pre-school. At least the first 2 who are speaking speak with me in Farsi mainly. I am hoping that they can master German just as well too. Thank you for writing! How wonderful: you have 3 kids that are learning 4 languages! Trying to analyze their relationship will be like solving an equations with multiple variables :) Did I understand it right that English is the community language? Were the older children exposed to English gradually? I have two hypotheses why the older child tries to speak English, one of his weak languages, to his siblings. It is possible that he associates the siblings with his peers and applies the same language "rule" while communicating with them, or maybe he feels a outside pressure to learn the language. Would love to learn more about your language situation - how much each of your kids exposed to each language on daily bases? Do they have play dates with other kids? What language do they speak playing? Very interesting article, going by my own experience, Im spanish speaker, my husband english speaker and we live in France, my boys are 5 and 3 at the moment and they ONLY speak english between themselves. I could by experience say the main reason in my case is because we decided to never speak French at home, no telly, no anything in French, and the language we talk between my husband and I is english. At some point they started to speak spanish when I was involved in the games, as I have never spoken to them in any other language than Spanish, but now even if I am playing they respond to each other in English and to me in Spanish. I am a bit disappointed they didn't choose spanish but happy they dont speak French between them as that is always going to be the must fluent language they will have. The eldest is trinlingual, he masters Spanish and English 100% for his age, and he speaks native French with a lack of some vocabulary and some complex grammar structures. The 3 year old has a speech delay though, he speaks and differentiates the 3 languages perfectly, he speaks Spanish and English, and not so much French but some, however his language is too basic and he doesn't express complex ideas at all. I’m a bit concerned about it because the eldest was miles away language skills wise when he was his age. The language they speak between them is English when they are with his father, Spanish when they are with me, and French whenever they are around the French teacher. Congratulations on getting great results in bringing up your children trilingually! And thank you for sharing your experience! I consulted with Julia Nemchuk, M.S., CCC-SLP, a Bilingual Speech Language Pathologist, regarding your case. According to her, you would need to “consider if your younger child is able to express himself in one or both of the two home languages in complete sentences (some of them complex), using specific vocabulary, and if his speech is more adult-like (rather than baby-like) in English and/or in Spanish. Does he speak one or both languages as well as his peers? If these criteria are met for one or two of the home languages, then he does not have a "speech delay". Talking about my personal experience ( my children are the same age as yours 3 and 5 years old), I can also see that my younger child is somewhat behind with language milestones compared to her older sibling. I believe partially it is due to the fact that she spends more time with her brother / me and her brother around, and less one-on-one time with me. Good luck to your family! And stop by again to let me know how things are going with your son. Thank you for your support! It is wonderful to hear that your kids speak Russian, which is the minority language, to each other. Good luck with your soon to be trilingual baby girl! Will she speak Russian, French and English as her brothers? Keep me posted about her language learning progress. I wonder now if I should direct it in any way or just let it flow... after all mu husband's minority language has the same rights as mine, however the levels of profficiency are dramatically different. My son is fluent in Polish and very basic in Urdu. I would leave things as they are. It is great that your kids practice speaking both minority languages to each other. You and your husband are doing a great job! :) Good luck! I have 3 kids, 2,5,and 7 and the older ones speak 4 languages. English, French, Catalan and Spanish. As far as I can tell they have the same fluency in all of them, I am told they have no accents and are indistinguishable from native speakers (that is the case in English for sure). So what determines a minority language our case? Day to day they probably have slightly less Spanish than the others, and speak whatever language of the primary adult around when talking among themselves. How wonderful that your kids are fully fluent in 4 languages! Minority and majority language terms can be a little confusing. In multilingual parenting when one talks about minority or majority language, she/he refers to the surroundings and not to the level of the fluency in a particular language. So majority language is the language spoken by majority of people, you could also call it a community language. Assuming you live in Spain, for your kids it is Catalan and Spanish. Minority language can be spoken by a small group of people or even by one person. For you I assume it is English and French. Like in my family, I am the only source of Russian for my children, but it does not stop my kids from being fluent it in. I know that Spanish parents try to teach their children English from early age. I see only the positive outcome in it. Many problems in this world come from people not being able to understand each other. Speaking other country languages shortens the distance between us. By exposing our children to other languages we grow kids that are citizens of the world, not just one single country. We raise kids who care and who widen their horizons with every new foreign language word they learn. While learning new languages kids learn other people’s culture. I also agree with Andrey, who in his Life story pointed out that sometimes knowing a language is worth it for its literature alone. I do not see my life without speaking English or Italian, which are non-native languages to me. I am used to the luxury of perceiving media (books, video ...) in its original language and I wish the same for my kids. So many feelings and important details can get lost or altered in the translation. Good luck on your multilingual family journey!